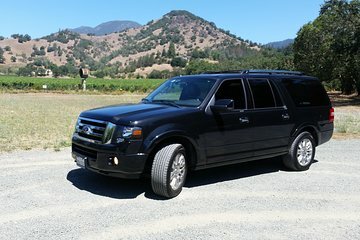 Arrange for a stress-free ride to San Francisco International Airport with this private transfer service. Meet your driver at your hotel in the city, and relax on the journey to SFO in a hybrid, sedan or SUV, depending on the size of your group (up to 6 passengers; select when booking). Note: This transfer operates only from San Francisco to SFO. The SUV used was clean and comfortable, but our guide was not as friendly and engaging as we expected him to be. To be fair, though, he provided many information about San Francisco. We also did not consume the entire 4 hours because we rushed some of the sites. Brilliant! Turned up early and got us there early, not one issue with this company. We had a lot of problems with another company on here and booked this one last minute. The service was impeccable. Even messaging me to confirm times etc the night before. Perfect!Thank you for a stress free journey! The drive arrived on time and got us to the airport in less than 20 minutes. He was courteous and very helpful. Excellent service. Both transfers, from and to the airport, were excellent. Service was courteous, and extremely punctual. I highly recommend this service, if you want a reliable and friendly service. Worth EVERY cent. The driver was on time, communicated via text with accurate information, and the vehicle was new and very clean. The driver also knew his way around the city and traffic. This was much more enjoyable than a taxi or shuttle service and the price was very reasonable. Our ride was on time for airport pickup and drop-off, he drove well no speeding or distracted driving and was very pleasant and polite. Would totally recommend this Viator service. Plus the vehicle was upgraded from a sedan to a Lincoln SUV. They arrived on time. Our driver was friendly and talkative. A very pleasant experience and wouldn't hesitate taking again. Fernando was very punctual, polite and courteous.